By 1886 ornate cast iron facades were lining lower Broadway and filling the blocks south of Houston Streets. Above 14th Street most merchants and developers still opted for brick and stone, with a few noticeable exceptions. 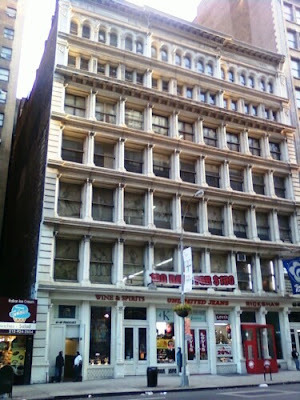 One of those exceptions was the Robert J. Horner & Co. Building at 61-65 West 23rd Street. 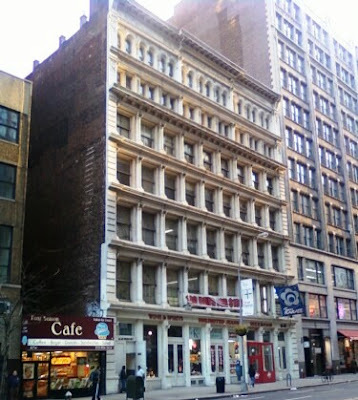 Just east of 6th Avenue, the Ladies’ Mile, the location was ideal. Designed by John B. Snook, the building rose seven stories in a restrained Italian Renaissance style. Snook’s design imitated stone, with rusticated piers flanking either side for five stories. Large, expansive windows separated by understated Corinthian columns -- formed by wrapped sheet metal rather than being cast in iron -- provided ample natural light to the upper showrooms. Above a bracketed cornice, the smaller windows of the factory level unified the top two floors as the rectangular sixth floor windows visually joined the arched seventh floor windows. Five sets of double tall doors, serving either as delivery , workshop, or showroom entrances were spaced along the street level. Robert Horner started his furniture business from the new building, initially manufacturing and designing all of his goods. Horner had a keen business sense, keeping up with changes in furniture trends. While other Manhattan cabinet makers like Herter Brothers targeted only the wealthy, Horner manufactured furniture in price ranges for the middle to the upper class shoppers. Horner’s ground-breaking concept in furniture marketing was to build in the upper floors furnished rooms to “show young married couples how they should set about furnishing their houses.” A drawing room, dining room, bedroom, library, billiard room and two halls were staged; initiating the standard of furniture showing used universally today. Business slowed in 1893 when the Financial Panic struck. Mired in the depression, customers cut back on unnecessary expenses – like refurnishing. In a cunning marketing scheme to draw customers, R. J. Horner & Co. installed the Princess Metternich salon when the Chicago Exposition was dismantled. “This is doubtless one of the richest collections of furniture in existence,” reported The Times, “and New-York people are fortunate in having an opportunity to inspect the beautiful salon. It is shown as it appeared in Chicago, when it elicited the greatest admiration. As the economy recovered, business did resume and R. J. Horner continued successfully in its 23rd Street factory and showroom. As the turn of the century arrived, however, the neighborhood was changing. One by one the ladies’ dry goods emporiums were abandoning 6th Avenue to move north of 34th Street. The many theatres that once dotted the thoroughfare were closing down, as well, as the Broadway theatre district expanded. On March 19, 1904 a catastrophic fire nearly ended the Horner business as well as its 24th Street warehouse and factory. At 10:30 in the morning an explosion of benzene was so powerful it was heard “for a considerable distance and was immediately followed by a sheet of flame that burst through the windows on Twenty-fourth Street,” reported The Times. Although the fire department reacted quickly, water pressure was so weak that they were unable to get the conflagration under control. By the time fire headquarters could arrange for the Water Department to increase pressure, the entire factory section of the building had been destroyed, a loss of between $50,000 to $75,000. 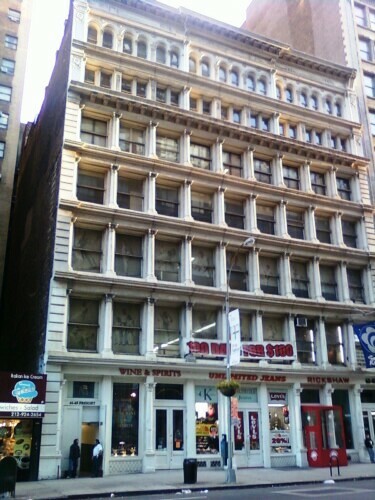 Nine years after Horner repaired the burnt building, the company moved to 36th Street near Fifth Avenue, following the movement of the shopping district. A year later, in 1914, the building was remodeled by Strobel & Wilken Company, a large toy importing firm. The move came at a time when the choicest toys were made in Germany and Austria and when those countries were entering dark political days with the assassination of the Archduke Franz Ferdinand that year. With the United States’ entry into the war, Strobel found himself standing alone in his arguments. In 1918 The United States Association of Toy Manufacturers met in the Hotel McAlpin and resolved to push Congress to enact a law against importing German-made goods. After the war business returned to normal. By 1937 the building was home to the National Silver Company, a distributor of cutlery. Like its predecessors, things did not always go smoothly. In February of that year the Federal Trade Commission took exception to National Silver’s use of the words “stainpruf” and “stainless.” The Commission felt the knives, forks and spoons were, indeed, stainable and issued a cease and desist order again the firm.